At last year’s Quiz/Bake-Off night, I was the lucky person whose name was drawn out of the hat (to the predictable chorus of “Fix! Fix!”) to get the free entry to the Edinburgh Marathon, which the club got in return for a bit of advertising of the event. I thought a report was a fair return. If you want to get a report of my own run in eye-glazing and mind-numbing detail, then I’m happy to give it, but here I’ll keep that to a minimum and try and give an impression of the event itself for those considering giving it a go. 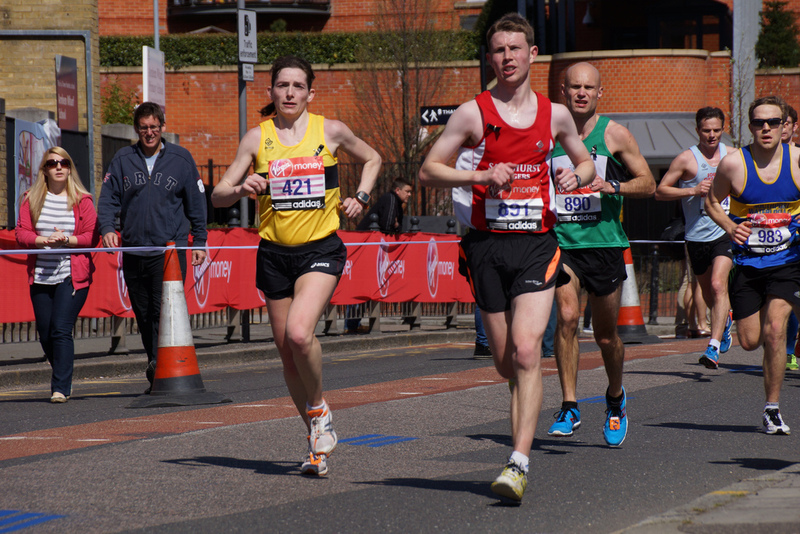 The Edinburgh Marathon is only one event run over a weekend as part of the Edinburgh Marathon Festival (“EMF”). There were actually eight events, ranging from Junior Races to the Half and Full Marathons [next year they are adding a ninth race, the“Kids Kilometer”]. So, a good destination for families or groups who don’t all want to do the full 26.2 miles. If they don’t want to do any running at all of course, Edinburgh is a great city to visit anyway. While there is an “EMF Hub” in the city with the usual expo-style pitches, and a Comedy Night on the Friday, I didn’t go to either as I only arrived in the city on the Friday evening to stay with a cousin. Two things to mention here: one good thing is that your number is posted so you don’t have to go anywhere to pick it up the day before; but one bad thing is that, since you probably are going to have to stay overnight, you should know that in common with any capital city and tourist destination, Edinburgh’s accommodation is far from cheap – get in very early to have any chance of a decent rate. That may mean staying a bit away from the centre, but at least the public transport is plentiful (even on a Sunday), reasonably-priced, and thanks to Edinburgh Council’s famously car-hostile attitude, quick. The start on London Road in the city centre took me aback. Based on having done London, I expected a real buzz and lots to see and do, but there isn’t a lot of space, so there is really only the starting pens, the baggage transportation lorries, an information tent, a local radio van, and portaloos. The Start Line, an hour before the off! Even the start line looked very temporary – just a couple of trailers. It was clear that this area was only allowed to be closed for a short while for the start, then cleared away. With no entertainment to be had except repeatedly attending to the call of nature, it was not surprising that even with half an hour to go, it was not busy with runners. It was odd not to have any other SJs to pass the time with, but runners being a friendly bunch, I soon found a couple of people to swap stories with. The buzz of a big-race start did eventually come and we set off to the tune (?) of two pipers hoisted up high (those start-line trailers turned out to be hydraulic lifts). Did I get the start time wrong? The course soon passed through Holyrood Park, with Holyrood Palace on one side and the striking architecture of the Scottish Parliament building on the other, while facing you was the dramatic cliff of Salisbury Crags. However, those hoping that this marathon would be a walking/jogging/sprinting (*delete where inapplicable) tour of the capital’s tourist sites had not looked at the route map. The route winds its way out of the city via a few miles of welcome downhill (oh, the temptation to ignore all marathon-running wisdom and ‘go for it’) and reaches the coast. But even though it would be great for more of the course to be in Edinburgh itself (up and down the Royal Mile to start? That would be fantastic!) , you shouldn’t be too disappointed that you have left the city behind. While, as with so many marathons, you have to go through some less-than-picturesque neighbourhoods, on the whole you are running along the coastal road (closed to traffic) and seaside town promenades. This is pretty much flat running, and you always have a view out over large beaches to the sea and the coast of Fife on the horizon, while the landward side is mostly open countryside and a succession of golf courses. Crowds are variable in size, but magnificent in their support of random strangers. Overall, easy to get relaxed and into your running, chatting to other runners if that’s your thing. Target time beaten, pain forgotten! At nine miles the route reaches Musselburgh. Crowds increase in this area because this is where you’ll be finishing. But before you get back to the town, you have 17 miles out-and-back along the coastal road, making the turn through the grounds of a country estate. Out-and-backs are not to everyone’s liking but as already said, the road is scenic and there is also the advantage of being able to see your supporters twice on this stretch – mine were at a point which was about 15 miles and 20 miles – just where you need a boost before digging in hard. Since the spectators are not rammed 6-deep as in London, you can easily meet up with them – just look on Google Earth for some good landmarks – as you can see each other from a distance. Despite the “big hoat baistart” and no breeze making it a sizzling last 9 miles, I did achieve my target time as I ran into the new finish area in school grounds in Musselburgh, though it really took great crowd support and some sheer bloody-mindedness to help me make it. Medal-hangers were cute school kids, but that’s not a patch on SJs at London of course. You do however have all you need at the finish, and get it quickly – water, shade, space to stretch and recover, and of course coffee wagons and burger vans for those who have not just seen their Lucozade Sport for the second time. Goody bag was average, finisher’s technical t-shirt good (if you really need another). The medal was an excellent design, with the famous silhouette of Edinburgh Castle standing up on its rock. This shape was recessed and only later did I find in the goody-bag a keyring of the same shape which slotted into that part the medal to complete the picture. Cool! If you do this event, don’t bother getting tickets for the shuttle buses – they leave so far from the finish area, you’ll be in despair by the time you get there. And don’t expect any supporters with a car to pick you up. Musselburgh is a small town and goes into lockdown for parking all day – they’ll have to park a loooooong way off. Better to get the normal public buses. Since you can’t be in a hurry whatever option you go with, worth going in to Musselburgh to make a pilgrimage to S.Luca ice-cream shop (http://www.s-luca.co.uk/) … it’s a real treat and you’ve earned it! Would I recommend this to others? Yes, especially if you combine it with a city break in Edinburgh with family/friends, and even more so if more than one of you runs in EMF events.